My goodness, there seems to be a feeding frenzy on the Absent Teacher Reservists in NYC (ATRs). The media is to blame, see the absurd comment posted below. Comments by the uninformed basically can be seen as ads for a change in policy, about to be announced by the DOE. I also posted below the missing money and computers from DOE schools, showing that the ATR situation is not the only mess currently being looked at. NYC Mayor De Blasio and NYC Chancellor Carmen Farina are implicated in this scheme to so defame the ATRs as to effectively get them removed from their jobs by an arbitrator at 3020-a faster than a blink of the eye. In fact, I just did a 3020-a for a teacher who had a Specification that charged him with making the NYC Department of Education "look bad" by having articles published about him and how he abused kids (not). Thus, incredibly, he was charged with false claims against him being published in the news (mostly the Daily News) and making the DOE look like they hire child abusers as teachers. Incredible. And the guy is innocent, on top of it. What is happening is that the UFT and the DOE want to get rid of the mess they made by having teachers who are not terminated at 3020-a become, automatically, ATRs. ATRs who win their 3020-a hearings have been able to prove that the charges against them were false and/or unproven by a preponderance of the evidence. These winners ARE NOT GUILTY as charged. But the UFT and DOE must make all ATRs guilty of something, because they are about ready to sign an agreement (just like they did in 2010 to end the rubber rooms), to change the policies regarding the ATR charging process and rotation. The media is an important part of this strategy. Without parents and deformer groups standing up to decry the despicable criminals in the ATR pool harming every child in their classes, the mess that is the ATR situation would not be seen as a disaster, and someone may point a finger at the UFT and/or the DOE for creating the mess in the first place. The UFT reached agreement on June 1 with the Department of Education on a voluntary severance package for UFT members who are in the Absent Teacher Reserve for at least one school year. The agreement sparked several newspaper editorials attacking the ATRs. Our recent ATR agreement generated its share of teacher-bashing editorials. Whether the media will print any of our rebuttals is an open question, but what is not up for debate is the UFT’s conviction that members of the ATR pool provide needed services to schools and that their work should be respected. Teachers whose schools have been closed or downsized will fill vacant classrooms in their chosen subjects this fall. Members in the ATR pool will also continue to play a valuable role in schools by filling in for teachers who are sick or on another form of sick leave. The real problem facing New York City schools is the thousands of teachers in good standing who walk out the door every year for other systems or other professions because of large classes, lack of supplies and managers who do not support their efforts to help children learn. Perhaps one of the editorial writers will accept my offer and join me on one of my school visits. Facts and time spent in the city's public schools would make for more accurate editorials. I am pointing to the UFT for not giving representation to ATRs and not allowing a chapter or chapter leader for ATRs. I am pointing to the DOE for automatically making all tenured teachers who win (are not terminated) the 3020-a arbitration into ATRs, and thus expanding the number of tenured "glorified-substitutes-ATRs" for no reason. etc, I could go on and on. The charges are just irrational in soooo many cases. NY Daily News and Chalkbeat: why aren't you doing THAT Story? As a mother, I try to do everything I can for my daughter. I make sure she eats well and works hard and I’m involved in her education. I do my part, and when I drop her off at school, I want to know that the educators are doing theirs. I have to trust that the principal is picking the best teachers and holding them to high standards. Last month, Mayor de Blasio made a decision that shatters the trust I have when I send my daughter to school. Principals across the city will no longer be able to select the teachers they want if they’re unable to fill a vacancy; instead, breaking a promise made by Chancellor Carmen Fariña, the city will force on the school an unwanted teacher from the Absent Teacher Reserve, or ATR. This is the pool of teachers from across the city who lose positions at their schools, either due to school closures, budget cuts or enrollment changes, or because of disciplinary records. They land in the ATR — sometimes for a short period, sometimes for a long one — because they are unable or unwilling to find full-time teaching positions after losing their placements. 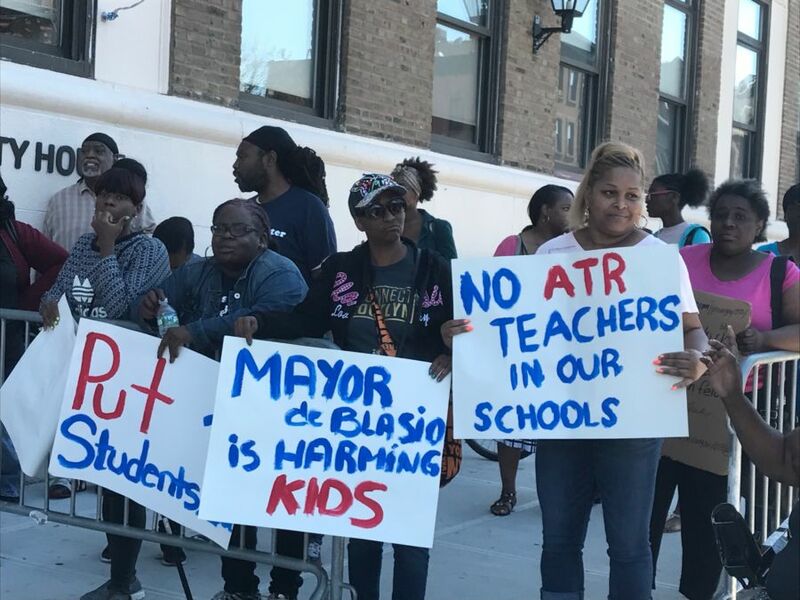 ATR teachers currently work in schools in month-to-month stints on an as-needed basis; now de Blasio and Fariña want to send them back into full-time positions in our classrooms. In a rational world, if a teacher couldn’t find a job somewhere in our massive school system, he or she would be cut loose. But because of the extreme legal and contract protections teachers have in this city and state, public-school teachers who lose one job and can’t find another stay on payroll. It would be bad enough if ATR teachers being sent back into full-time jobs would be equitably distributed across the city. But based on everything we know, they are certain to be concentrated in low-income neighborhoods, which already get the short end of the stick educationally. Nearly two years ago, an education group requested information about who was in the ATR at that time and where they are being placed. The Department of Education wouldn’t release details. We know that in 2014, a third of the teachers in the ATR had unsatisfactory ratings and a quarter faced disciplinary charges. More than half of them had stopped even applying for teaching jobs, meaning they weren’t so interested in being in the classroom. Many if not most of these teachers are unwanted for a reason. But all the mayor seems to care about is rewarding the teachers union during an election year. So instead of fighting to protect public-school kids, he is focused on building support for his reelection campaign. I started to become very concerned about teacher quality ever since a teacher at my kid’s school, Public School 256 in Bedford-Stuyvesant, Brooklyn, was arrested and later convicted. Parents should trust that only quality teachers can stay in the system, but the ATR pool is evidence of the opposite. In September, my daughter is starting fifth grade at PS 256, and I am terrified that a subpar ATR teacher, or one with a disciplinary record, is going to become her teacher. There are vacancies at the school, so this is a very real possibility. When principals don’t have final hiring authority, the chances increase that a bad apple can be placed in the classroom. A 2015 report by the federal Education Department confirmed what many of us feel every day in our communities. Schools in low-income areas with high percentages of minority students tend to have more teacher vacancies. So when de Blasio sets out to empty the ATR pool, these impossible-to-place teachers are going to end up in schools with lots of vacancies. In other words, the worst teachers will be sent to schools with families who don’t have the political clout to protect their kids. Just because I live in Bed-Stuy doesn’t mean my kids deserve any less than the kids in Park Slope or the Upper East Side. I am fed up at having my kids constantly be treated like second-class citizens in this very unequal public school system. 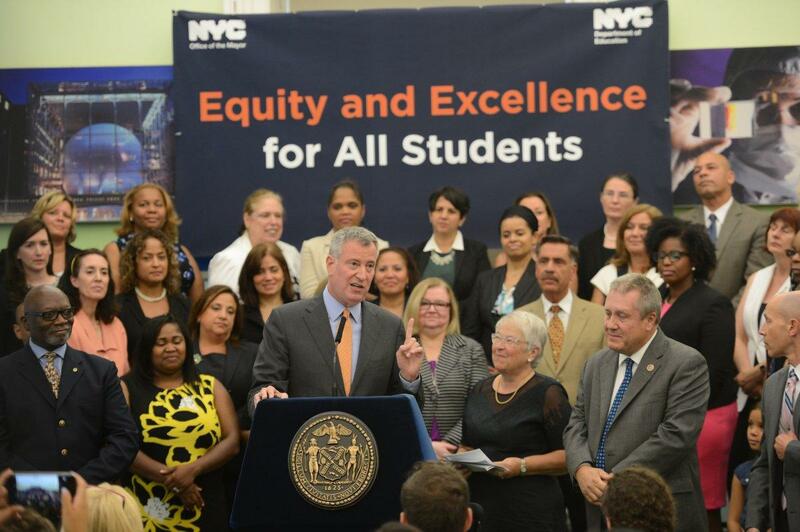 I know the mayor would never have allowed this to happen in his own kids’ schools, so he shouldn’t do it in mine. Kids in my neighborhood deserve quality teachers, not the system’s leftovers. Thomas is the parent of a rising fifth-grader at PS 256.
for the Department of Investigation to look into de Blasio’s handling of the agency. 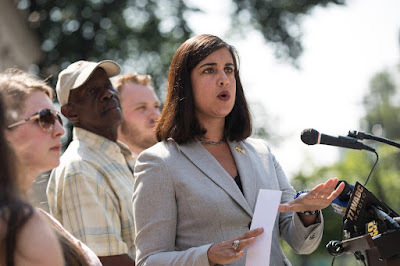 Republican mayoral candidate Nicole Malliotakis called Tuesday for a Department of Investigation probe of education contracting, charging wasteful spending has run rampant under Mayor de Blasio. Malliotakis cited three recent audits by City Controller Scott Stringer — who has endorsed de Blasio for re-election — into the Department of Education that found missing equipment or a lack of documentation on how money was spent. One audit by Stringer found that more than 1,800 computers were missing from nine schools and school offices, while thousands more were not properly accounted for in records. Another audit found DOE spent hundreds of millions of dollars to upgrade internet at public schools, but couldn’t provide any budgets or timelines, and more than half of surveyed schools said internet was too slow to meet their needs. A separate probe found that 98% of sampled payments to the New York City Leadership Academy, which got more than $100 million in contracts for teacher and principal coaching, were not supported by required documentation. Stringer criticized the GOP pol for invoking his reports. "Our audit shouldn't be used as a political football. We do this work for our kids — and it shouldn't be cheapened and exploited by adults,” his spokesman Tyrone Stevens said. While each matter has already been audited, Malliotakis said DOI was better equipped to investigate whether there are systematic failings in DOE’s contracting because its investigators have subpoena power and can make referrals for criminal charges, though she did not cite any evidence that a crime occurred. De Blasio dismissed his opponent’s attacks, which have also recently included going after his supervised release program. “The things she talks about consistently show that she’s out of touch with the values of New Yorkers,” he said Tuesday.